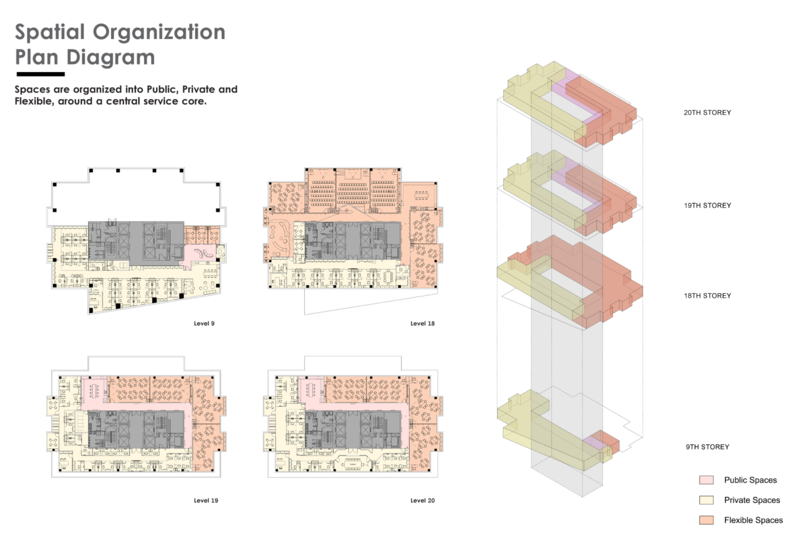 The project brief calls for a design of the Social Service Institute (SSI), located over 4 floors at Central Plaza, with total floor area of 2 600sqm. SSI is the training institute and career centre for social service sector in Singapore. There are two main areas in SSI, namely the Training Facilities which provides training and career guidance for the public and the Staff Office which provides back end support. In response to SSI’s ethos of providing a holistic learning environment, the design strives to achieve borderless and collaborative learning, reaching out and community sharing through spatial planning that is sensitive to the environment and users’ requirements. The given floor plan is a typical rectilinear office floor plate with a large central core. The average length from the core to the façade is about 10m. With such a narrow width, we faced the challenge of using the floor plate to plan for big event spaces like an auditorium. In addition, the programme is distributed over 4 floors, the 9th storey and 18th to 20th storey. Continuity is broken. Connectivity and relationship of the programme must be considered horizontally and vertically at the same time. Instead of adopting a strict segregation of training facilities and staff office by floors, we allocated half the area (public) of each floor to students and the other half (private) to staff. We introduced informal collaboration spaces when public meet private. 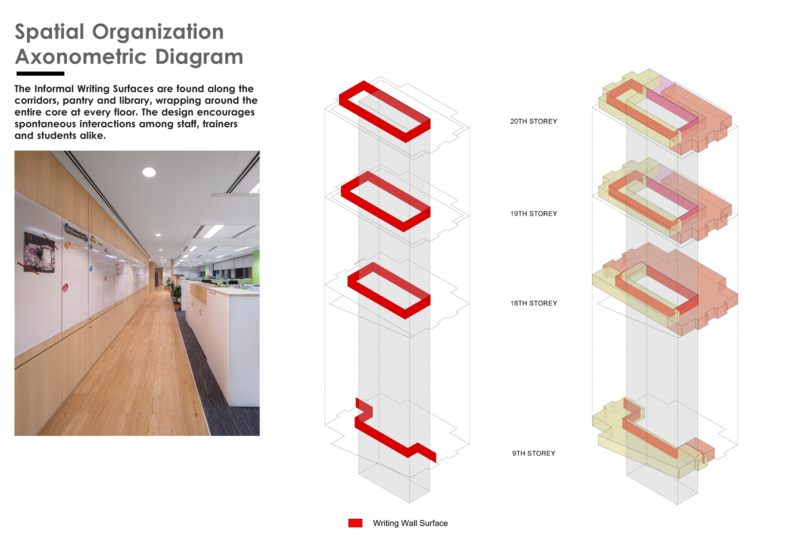 These informal collaboration spaces are pantries, library and corridor with writing surfaces nicely wrap by back painted glass around the entire core at every floor. Continuity is felt when user travels from one floor to another for training and meetings; continuity is felt when users interact at these informal collaboration spaces. The design encourages spontaneous interactions among staff, trainers and students. The auditorium at 18th storey is the biggest event space. The size of the auditorium can be configured per the needs of the events with the use of operable walls on all sides. It could be divided into 3 classrooms or 1 big auditorium. The auditorium space can be further enlarged by opening up the walls along the corridor, hence making the corridor part of the auditorium. The use of operable walls is also extended to all classrooms such that the size of classroom can adapt according to the class size. The workstations for staff are planned in an open concept layout. With­out high partitions, the layout hopes to encourage communication and collaboration among staff. 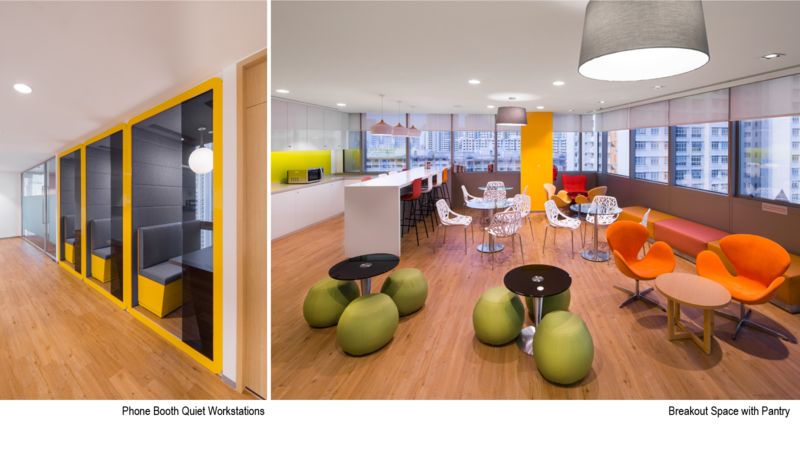 The staff office are distributed across all floors with different themes and each floor will have a cluster of quiet workstations in phone-booth concept. These phone booths allow staff to retreat if they need a quiet space to work. 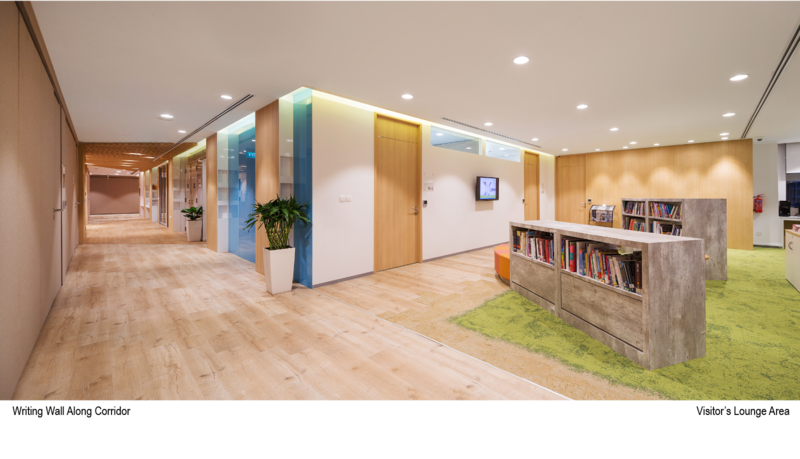 Walls along corridor are designed as full height cabinets with pin-up board for exchange of ideas and discussions. 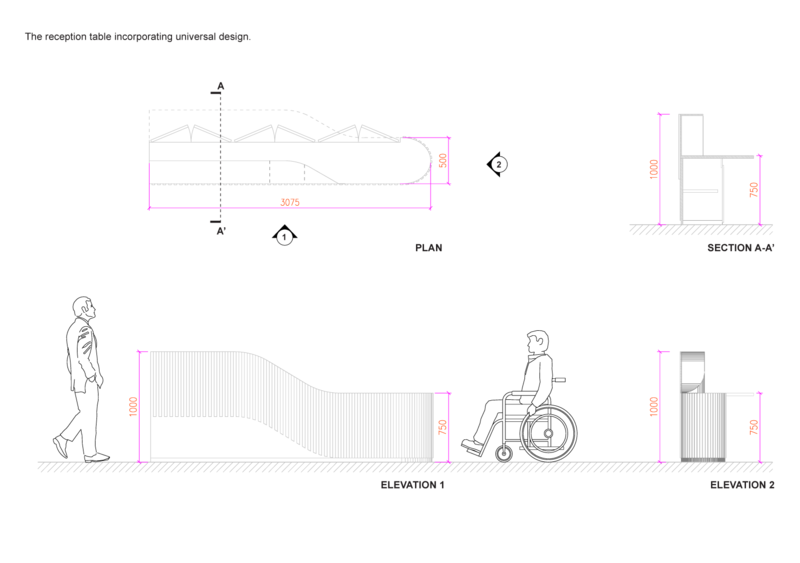 As SSI is frequent by the public, Universal Design is adopted to create an environ­ment that will address the needs of all age group and people with different needs. 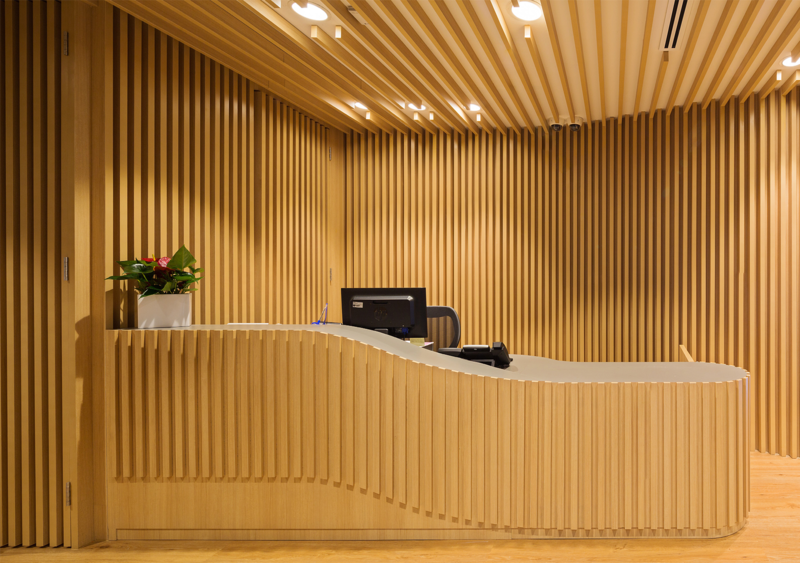 At the entrance recception, the desk is designed with a sloping profile to allow the receptionist to engage with a person on wheelchair at the lower counter area, and to engage a standing adult at the higher counter area. This inclusive design is extended to the entire SSI spaces so as to encourage a fair environment where people of all walks of lives have a right to the space without compromise.